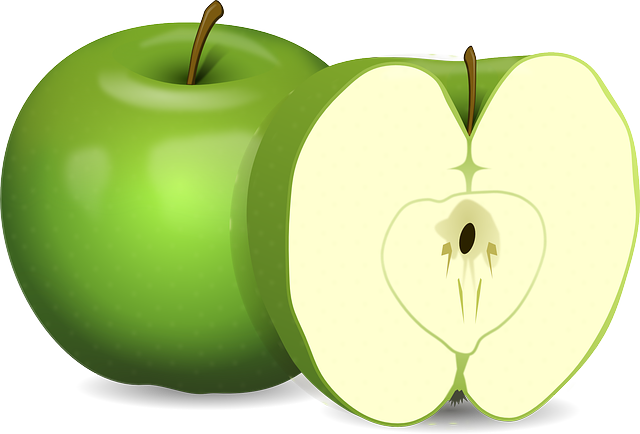 In what the food industry is hoping will be the breakthrough product for genetically modified organisms, (GMOs), a non-browning apple is about to be introduced in Midwestern grocery stores, perhaps as early as February 1st. This high-tech apple will be sold under the brand Arctic Apple. The first introduction will be a test run to see how well the public accepts the controversial apple, which will be sold pre-sliced. The industry is hoping that the convenience of pre-sliced apples that do not turn brown will overwhelm the suspicion consumers have of GMOs. Both critics and supporters of GMOs say that this product could be a “tipping point” in the country’s hot debate over the merits and dangers of genetic engineering, especially as it relates to food. Until now supporters of genetically engineered food have argued that the technology protects crops, bringing down prices, reducing the use of pesticides, and bestowing other benefits. 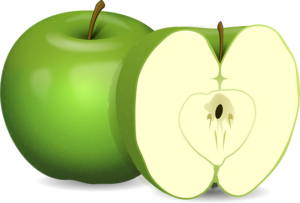 The Arctic Apple is one of the first GMOs marketed directly to consumers strictly for its convenience factor. Despite the fact that there is a consensus among scientists that GMOs are basically safe, over the course of about 30 years environmental and consumer groups have been able to limit the use of GMOs to commodity crops like soybeans and corn. The question the Arctic Apple will put to the public is whether the convenience of having pre-sliced apples that do not turn brown outweighs the bad rap GMOs have in the eyes of consumers. 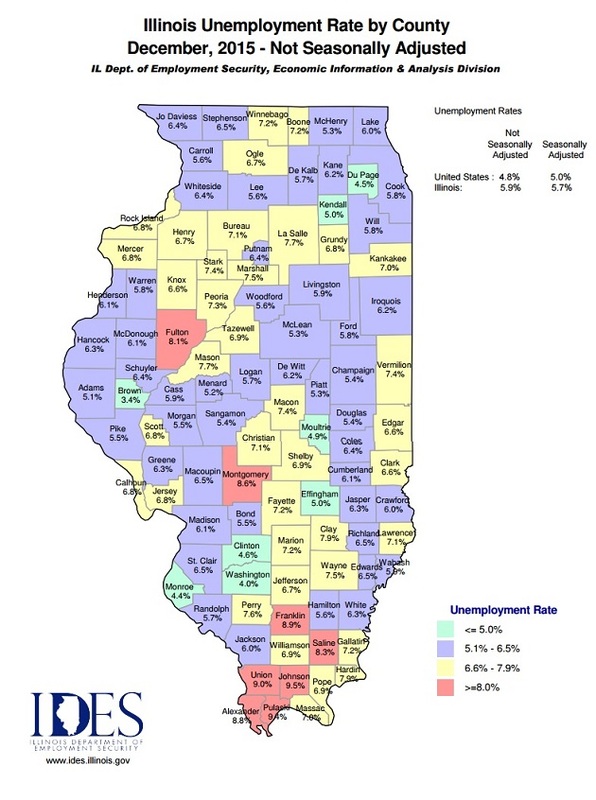 Illinois Unemployment rate by county. Although the last month of 2016 was disappointing for Illinois job-wise, the year as a whole finished in the black. At the end of 2015 the unemployment rate in Illinois was 6.1 percent, higher than the 5.7 percent the rate reached at the end of 2016. But the month of December, 2016 was not a good one for employment. The state lost about 16,700 jobs that month alone, bringing the unemployment figure up to its final rate for the year, from 5.6 percent at the end of November, 2016. November also had a net loss of jobs instead of the predicted gain. Illinois ended up losing 4,500 jobs in November rather than gaining 1,700, which had been forecast. Illinois is experiencing the same job loss trend as the rest of the country, but slightly more pronounced. The rate of job growth in Illinois was 0.5 percent, a bit slower than the nation’s figure of 1.5 percent. 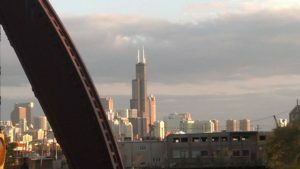 The country also saw a slight rise in unemployment for December, to 4.7 percent, significantly lower than for Illinois. “Illinois needs structural reforms and a balanced budget to attract new jobs and investment in our state,” said Sean McCarthy, acting director of the Illinois Department of Commerce and Economic Opportunity. 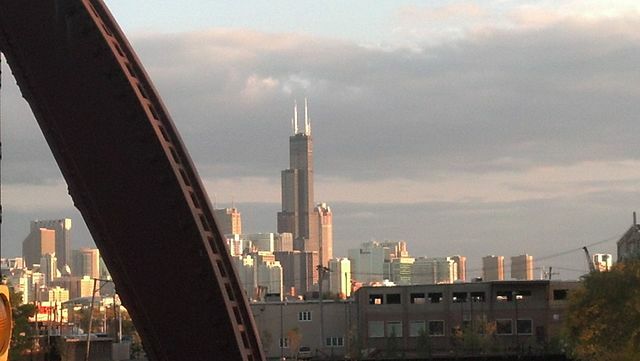 Chicago skyline seen from Cortland Street Drawbridge. Photo courtesy of John G. Suhayda. Computer hardware engineers who got the axe last September during a massive downsizing at Motorola’s Chicago headquarters soon found that they were in demand by some of the country’s most successful high tech companies. It was only a matter of weeks before these newly unemployed engineers were fielding job offers from company’s like Google, Facebook and Apple, who held recruiting events. Amazon also made offers to several of the engineers. What were these computer-high tech giants hoping for? Mostly to bring these highly skilled workers back home to Silicon Valley. In the case of Google, however, their goal was a bit different, and unique. The search engine giant used the Motorola layoffs to recruit hardware engineers, for the first time, to work in their Chicago office. Until this time Google’s only Chicago hires had been for jobs in software development. Some of the former Motorola engineers who were at the meeting said that Google had organized a gathering within two weeks of being fired. There were at least 200 hardware engineers in attendance, all of which had been fired by Motorola. During an information session the Google reps demonstrated some of its new hardware products and then discussed bringing jobs in computer hardware development to their Chicago office for the first time. A screwdriver-handled bottle opener, made by Western Forge for the Craftsman brand. Photo credit to J.C. Fields. A complex deal has been struck between Sears and Stanley Black & Decker, for the purchase of Sears’ iconic Craftsman brand of tools. Illinois-based Sears has agree to see the 89-year-old brand to Stanley Black & Decker for $525 million in cash and an additional $250 million by the end of the third year after the sale. In addition, there will be payments for up to 15 years as a variable percentage of sales. The approximate total value of the deal is $900 million, according to Sears. The deal will allow the Connecticut-based Stanley Black & Decker the right to produce and sell Craftsman-branded tools in non-Sears stores in the US and internationally. Sears will also be able to sell Craftsman in its own stores through a perpetual license issued by Stanley Black & Decker. Stanley Black & Decker will receive royalties from Sears after a 15-year grace period. The deal stipulates that Sears will receive annual payments from new sales from Stanley Black & Decker Craftsman during a 15-year period. Between now and 2020 Sears will get 2.5 percent of sales; from 2020 until 2023 3.0 percent; and for the remaining time, 3.5 percent. An exterior image of Ann & Robert H. Lurie Children’s Hospital of Chicago. Photo courtesy of Ala1188. 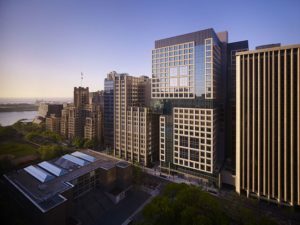 The Ann & Robert H. Lurie Children’s Hospital of Chicago has plans to expand the highly in-demand hospital’s capacity with a $51 million infusion of funding. The Streeterville building, in the midst of the Mag Mile, is seriously overcrowded, and can use the extra beds under consideration. The plan proposes to add 44 beds to the already 92 that serve the intensive-care unit. The hospital would also like to add four more beds to the neonatal intensive-care division to 60 NICU beds that are there now. The total number of beds in this specialty hospital, which treats the area’s most ill children, would rise to 336. The application Lurie filed last month with state regulators said that the hospital, which partners with many community hospitals, has been fielding an increase in children referred by health care providers is northeast Illinois to the point where they have been forced to refuse transfers. The hospital wants to add beds at a moment in history when other hospitals are downsizing their pediatric departments, if not eliminating them altogether. Because the Affordable Care Act puts more of an emphasis on prevention, many hospital beds are empty, while there has been a growth in the number of outpatient clinics and same-day surgery facilities. Lurie hospital says that demand for its services has climbed because of its partnerships with over a dozen community hospitals. If the patients can be kept in those local community hospitals, they are. But if they need more sophisticated or intense care, they are then sent to the downtown hospital. In 2014 Lurie switched 20 medical-surgical beds, the most common type of hospital bed, to ICU beds. In 2016 Lurie had to turn away 112 requests for patient transports because of lack of beds. The additional beds will be added by renovating existing hospital space, with completion of the projected expected to be by January 31, 2019.